Windows users have a lot of good video players to choose from, and the title of “best” is hotly contested. For its great performance, high number of features, and ability to play just about anything, we recommend PotPlayer for all your video playing needs. More advanced settings in the Options menu than you can shake a stick at. For more info, see their homepage. PotPlayer, like many of our App Directory picks, shines in its sheer number of settings. You can tweak just about everything of your video, from simple brightness and contrast to deinterlacing, postprocessing, and de-noise to get the best video playback possible. 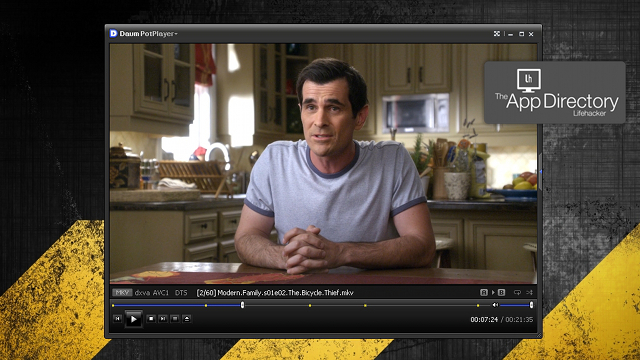 No matter what quality of file you’re stuck with, you can probably make it better with PotPlayer. On top of all that, it’s fast, lightweight, and can play any video format you throw at it, including damaged files. It’s got loads of keyboard shortcuts and mouse controls, and while it’s very advanced, its interface is more than easy enough to use for less tech-savvy people (as long as they don’t venture into the preferences). As with most advanced programs, PotPlayer’s biggest strength is also one of its biggest weaknesses. It has a ton of different settings, which unfortunately makes wading through the checkblox-laden settings menu kind of a pain. Even if you’re rather tech-savvy, it could take you awhile to find the setting you’re looking for. While that’s never fun, though, it does mean you can tweak every aspect of the player to work how you want, so it’s a small price to pay, and most of your videos should work great out of the box. We do wish it could save those settings on a per-video basis like SMPlayer, though. In addition, it’s pretty young, and still technically in beta, so it’s possible you could experience some bugs (though many have found it more than stable enough for daily use). Lastly, as a Korean program, you’ll find tiny bits of the program are still in Korean, but it’s nothing that would hinder you from using it—just a button or two here and there. All the preferences have been translated well. PotPlayer isn’t perfect, but we’ve yet to find a video player that is. It will play a lot of files, but if it ever doesn’t, we recommend having a backup video player on hand (no matter what you use as your primary player). Here are a few of your options. The most obvious competitor to PotPlayer is VLC, which many of you probably use as your main player. Both are pretty close in terms of quality, but PotPlayer’s nicer interface, lighter weight, and tons of advanced features all bring it a step up above VLC in our eyes. In addition, if you have an older computer and you’re playing high definition video content, you may want to try them side-by-side: while PotPlayer was lighter weight in our tests, VLC does have built-in hardware acceleration features that may play high-def videos a little smoother. Media Player Classic is another choice on Windows, which, coupled with a codec pack like K-Lite Basic or CCCP, can play most of the important video codecs. Its biggest advantage is its hardware acceleration, which is great for older computers if you want to play high-def video. It also has a neat “remove screen tearing” feature, and the ability to customize tons of keyboard shortcuts. Its interface, however, is pretty hideous, and the need for codec packs just adds one more thing you need to install and manage, so we aren’t huge fans. However, it’s very popular with keyboard maestros, as well as those that need good subtitle support (like fansubbed Anime fans) since it’s very good at managing subtitles. Other lesser-known video players include SMPlayer, which lets you set your settings on a per-video basis, and Gom Player, which has quite a few advanced features, though not quite as many as PotPlayer (though if you’re having stability issues with PotPlayer, Gom is a good alternative to try). Again, there is no perfect video player out there that works for everyone. Like music players, everyone has their favorite video player and you guys are probably pretty loyal to yours. It’s mostly personal preference, so if you have a player you think is best, let us know why in the comments (without putting down other people’s choices).